Far away, inaccessible and overpoloticized. You might have one of these or all of these images towards the United Nations. And you may be right but not 100%. Yesterday afternoon, training on UN mechanisms took place. Sheherezade Kara of ARC International, facilitator of the session briefed Asian LGBTI activists about the history of sexual orientation and gender identity issues at the UN including General Assembly resolution on human rights, sexual orientation and gender identity in 2009. She explained different UN human rights mechanisms such as Human Rights Council, Universal Periodic Review and special procedures where LGBTI activists could be engaged. Participants were divided into small groups. Among some twenty participants, most of them seemed to have some sort of experiences with UN system. UPR was the most popular. Groups exchanged their experiences at the UN, successes and challenges. Sheherezade responded to questions and comments by participants. Later in the session, UPR was focused. UPR is a new mechanism of the UN which started in 2008. In the mechanism, the human rights practices of all UN member states are reviewed once every four years. Sheherazade walked the participants through what UPR was, how the system worked and what LGBTI activists could do with it. Those who are interested to know more about UPR, following pages will help you. I shared my experiences engaging with UPR from NGO report submission, being at the UN in Geneva and to domestic lobbying for implementation. 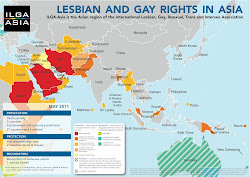 International organizations like ILGA and ARC International help LGBTI activists being engaged with UPR. More LGBTI activists are making use of the UN mechanisms. Most important in the process, the session stressed was implementation back home.